Accidents involving animals are not uncommon and happen in urban or suburban as well as rural areas. Avoiding an animal can also lead to injury and property damage accidents if the motorist is speeding, swerves too sharply and loses control of the vehicle. This can lead to a collision with another car or object, or the car rolling over or ending up in a ditch. If you are injured in a collision with a pet or farm animal, contact a Boston accident lawyer to discuss your legal options. In Massachusetts, a road encounter with a large animal could include a deer, horse or a cow, particularly in rural or farm areas though you may well see deer on the roadway in the suburban areas of Boston and many parts of Massachusetts. An accident with a deer can cause significant property damage and possibly personal injury. 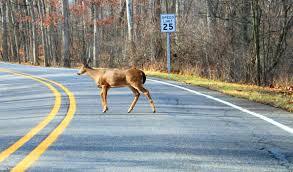 More deer-vehicle accidents occur in the fall when deer are breeding and during the evening and dusk. Although there are no official statistics, the insurance industry estimates there are over 10,000 accidents with deer each year nationwide. Most accidents severely injure or kill the animals with few if any fatalities to drivers though injuries do occur. Since deer are wild animals, there is no third party liability though your own auto policy should cover the property damage. Careful examination by an experienced attorney may find third parties responsible in many situations, however. Horses, cows and pigs are livestock that are required to be kept penned up or fenced in. Any time a horse or cow wanders onto the roadway, it is the legal responsibility of the owner for any injuries or property damage should an accident occur, including injuries or fatalities. There are about 1,000 moose in Massachusetts though the chances of seeing one in the Boston area are highly unlikely. Still, given their large size and weight, your chances of sustaining a serious accident or fatality are much greater if your car collides with one. If you are in a rural area at night, be aware that deer and possibly a moose could stray onto the roadway. State statistics indicate there are about 30 car collisions with moose each year. Accidents with dogs or other small animals like raccoons are more common and can happen anywhere. Like farm animals, most dogs have owners who are obligated to control their animals and not allow them to wander onto the city or suburban streets. Most car accidents involving small animals kill the animal and cause little or no property damage. Property damage can be paid for by the dog owner’s homeowner’s policy. If there is none, your own comprehensive coverage should cover the expense or you can sue the owner in small claims court. A car accident in Boston with an animal, especially a large one, can lead to personal injuries. If the animal is domesticated with an owner, you can bring a claim against the homeowner’s policy or directly against the owner. Your award for pain and suffering is based on the nature and extent of your injuries and the affect it has had on your daily life. Your car accident lawyer will examine your medical expenses, property damage, surgeries, recovery and recuperation, lost earning capacity, degree of permanent impairment, vocational training if necessary and inability to enjoy or to engage in the activities you did before the accident. There may also be other avenues of compensation for you such as the FMLA, or the Family Medical Leave Act, where even if you miss weeks or months of work, your job and benefits will be protected. Consult with Neil Burns and Roshan Jain, a personal injury law firm that has handled car accident issues involving animals during their combined 25 years of legal practice. Call them today at 617-227-7423 for a free and confidential evaluation of your accident case.